We’re living in a society that is feeding off our sin inclinations, our easily addicted natures, and our naïveté. We, the masses, are harassed by overexposure to sexual material. We’re drowned in constant visual content that battles for allegiance and infatuation in our hearts. And we’re blinded by images that muddy the clear vision of God’s desire for purity. We’re sheep without a shepherd, addicted to our lost wandering. But even here Jesus meets us with compassion. His grace extends salvation to us and, in the same breath, refuses to leave us the same. The compassion of a God who sees us in our filth and washes us clean has the power to alter our perspective. Because when we invite the Holy Spirit to censor our lives and make sensitive our eyes, his response changes our vision. In this article, the author points to Virtual Reality and how it's starting to pop up in video games, but it will soon be used for far worse things than that. He encourages us to get ahead of the trend by thinking through how we will incorporate VR into our lives and the lives of our family. Roots is headed to a UK baseball game May 12 vs. Missouri. The game is at 2 and we will leave from the church at 12. The cost is $8. Plan for your student to eat lunch before departure or wait for a late lunch at the park. Depending on the length of the game, we will grab a quick dinner on the way home. Let me know if your student is going so I can purchase tickets before they sell out! 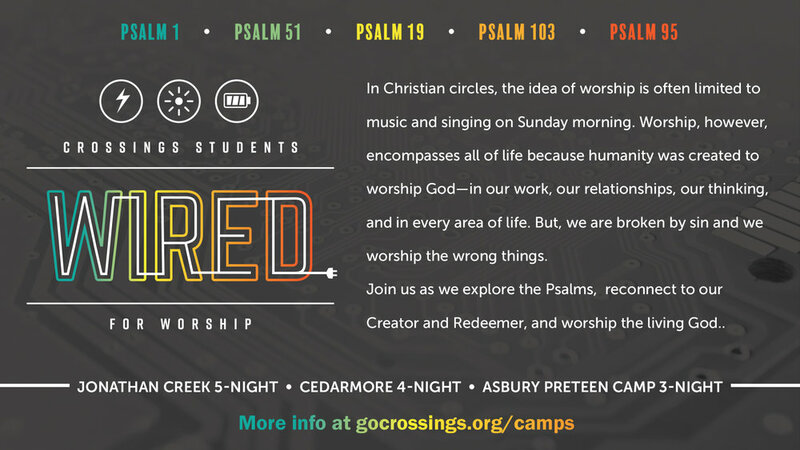 Camp sign-ups are going on now! I need to know if your student is attending and I will have parent packets available soon.